The H CB Motor Transport Section. These photos are of the transport section of the HCB the one to the left is taken outside the 'Falcon' public house in Market Square at Huntingdon. Its location is almost on the same spot as the Huntingdon War memorial was located after the war. there was some communication in the local press and between interested parties at the time of the planning of the memorial that the statue should be of a Hunts. Cyclist, but, after heated debate, it was decided to erect a statue of ' A Thinking Soldier' . 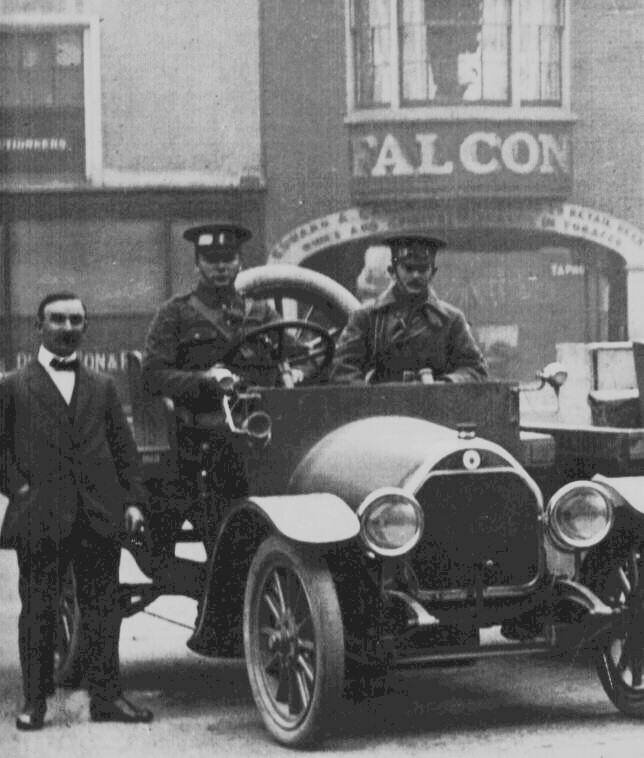 The photo is only a small part of a larger photo showing a line of seven cars all converted for the use of the H C B by the local garage Messrs. Murket Bros.
Mr. Murket can be seen standing next to the car. This photo is of the transport section of the H.C.B. whilst on patrol on the east coast. 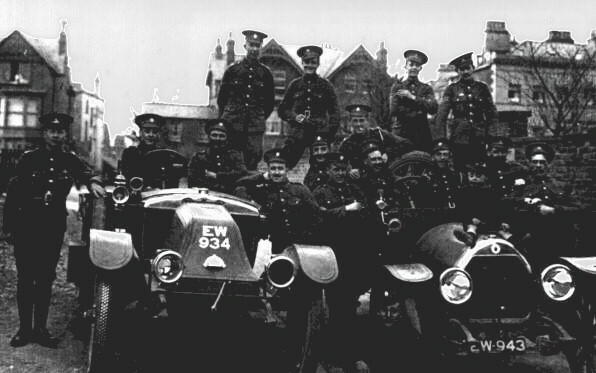 The original photo quite clearly shows two types of cap badge, one being the H.C.B. the other looking like the Army Service Corps who were also in the area. The E W number plates relate to a Huntingdonshire registered vehicle. Picture of the H C B Motor Transport section including George Swearer. Congratulations to Lance Corporal George Swearer, son of Mr. & Mrs. A. N. Swearer, Blenheim Road, Ramsey, who has been awarded the French Croix de Guerre for conspicuous bravery with the tanks. Lance Corpl. Swearer is attached to the Tank Corp, and has been in the thick of the recent heavy fighting, in which he was slightly wounded. outside the Bridge Hotel, Huntingdon, during the early years of WWI. It is the only known photo of a motorcycles side car that the HCB had. It is not known who the people above the balustrade are, possibly the hotel owner? 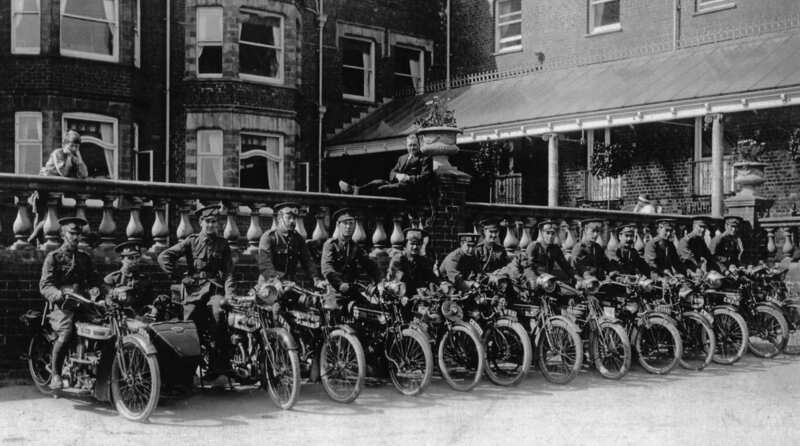 From a local newspaper dated 21/8/1914 - Motor Cyclists on service. Lance-Corpls. Allpress Ruston (St. Ives), A. W. S. Cowie (Hamerton), C. W. Peacock (Huntingdon), R. M. Woolley (Huntingdon), R. P. Warren ( Peterborough ), C.A. Bryant (Huntingdon), T. Patterson ( Peterborough ), went by road on Wednesday to join the Hunts. 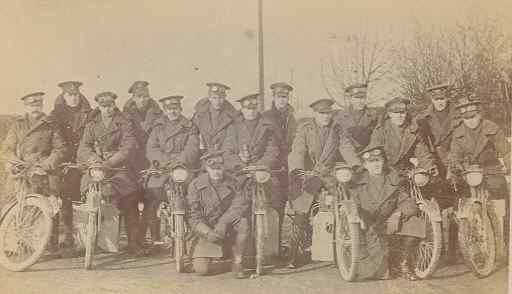 Cycle Battalion at Hornsea, Yorks , the distance being 150 miles.